The Democratic Party of Korea’s leadership on Wednesday deferred taking any disciplinary action against Gyeonggi Provincial Gov. Lee Jae-myung, who has been indicted on several charges, including violating the election law. The ruling party has been reviewing what action to take against its member Lee, who has been investigated by police over a series of allegations regarding his family and his election campaign for the governorship. On Tuesday, the prosecution indicted him without physical detention. Rep. Hong Ihk-pyo, the party’s senior spokesman, said the party has “made official” Lee’s request to suspend his membership. “Suspending the membership does not mean he is not a member of our party. There is no set deadline, and he can recover his membership after the trial, or he could be sent to the party’s disciplinary committee later,” Rep. Hong told reporters after the meeting. Lee is accused of lying during a televised debate of gubernatorial candidates during this year’s June local elections. He had denied abusing his authority as then-Seongnam mayor to force his now-deceased older brother to be institutionalized in a mental hospital against his will. On Tuesday, Lee announced he would give up all his authority as the ruling party’s member. While he holds no official position in the party, he has held six ex-officio posts as a provincial governor, according to the ruling party. “Nothing is more important than to prevent division and to consolidate, when it comes to political parties. It is also the responsibility of a member to not become a burden to the party,” Gov. Lee said in a Facebook post. Regarding prosecutors’ indictment, Lee said he had “expected” it. He has been denying his charges and claimed police are “politically manipulating the plot” against him. In addition to the prosecutorial charges, Lee is also embroiled in a series of scandals concerning his family and his personal life. 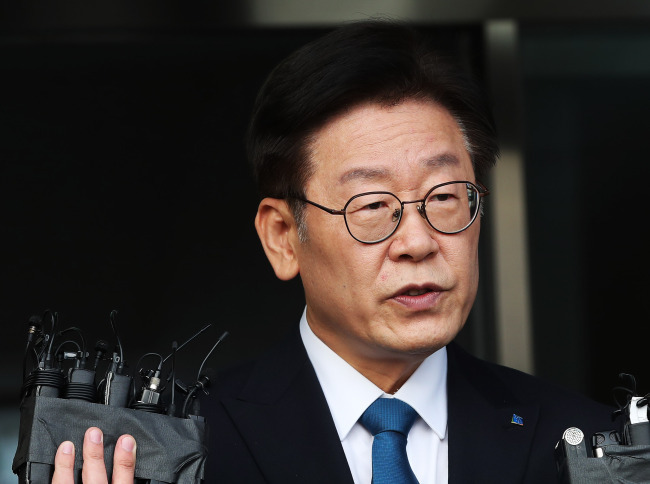 Among them is the accusation that he had spread false information about his criminal records and a local land development project when he was running for Gyeonggi governor in June. He was also investigated for defamation in a case brought by an actress who claimed to have had an extramarital affair with him. The Democratic Party had been discussing what actions to take on Lee. Having served as Seongnam mayor, the lawyer-turned-governor was also a contender in the party’s presidential primary last year.